Overview - The sheriff of a suburban New Jersey community populated by New York City policeman slowly discovers the town is a front for mob connections and corruption. It's not always easy to do the right thing. In fact, it's often extremely difficult. Standing up for integrity in a corrupt world can be a losing battle, deterring many from even trying. Still, every once and a while a lone voice of bravery and reason rises up from the dreck, casting corruption aside in favor of staunch, unfiltered justice. Like the cowboy heroes of yesteryear, they ride into town and clean up the filth, restoring balance and order where lies and greed have become king. Taking its cue from classic westerns, 'Cop Land' presents a gritty and tense drama about one good man's refusal to simply look the other way. Though there are some sporadic issues with the script, thanks to some strong direction and a talented ensemble of larger-than-life performers, the film effectively burns to an explosive and powerful climax. A sort of modern retelling of tried-and-true western sensibilities, 'Cop Land' focuses on an unassuming and easygoing small town sheriff named Freddy Heflin (Sylvester Stallone). The town he presides over isn't just a typical suburb, however, as its close-knit population is predominantly made up of big-shot New York City police officers. Since crime is almost nonexistent in the cop infested town, Freddy is rather lax in his law enforcement duties, usually deferring to resident Lt. Ray Donlan's (Harvey Keitel) judgment and orders. When Donlan's nephew, who is of course also a cop, is involved in an unnecessary, deadly shooting, the young officer appears to take his own life. Doubts about the alleged suicide arise and an investigation led by Moe Tilden (Robert De Niro) of Internal Affairs starts to uncover massive corruption amidst the seemingly lawful suburb. Faced with the unsavory truth about his town, Freddy must decide whether to continue turning a blind eye to injustice, or finally rise up and take the law into his own hand. With a cast made up of legendary performers like De Niro, Keitel and Stallone, each actor brings a certain level of baggage to their roles. Mangold does an excellent job of utilizing this to his advantage, using each actor's cinematic history to enhance the experience. As soon as De Niro and Keitel appear on screen there is an instant familiarity shaped between them and the audience, informed by the actors' storied and rich filmic past. While most of the ensemble's previous filmography complements the archetypes they play here, with Stallone, the director purposefully casts against type, drawing a sharp contrast against the actor's iconic, tough-guy persona. Together they create a memorable and wonderfully nuanced character that is the antithesis of the action hero's typical roles. While Stallone has been in some great movies over the years, with few exceptions, he's not really known for subtle character work. As the overweight, partially deaf, and heartbreakingly pathetic Freddy, the actor flexes muscles we didn't even know he had, forging an emotionally layered character. Stallone went so far as to physically transform his usually chiseled self into an out of shape everyman of sorts, and the results are quite impressive. Sure, even with a beer belly the man can't help but carry a certain intimidating appearance, but coupled with his sad, underplayed, almost laconic demeanor, he becomes a completely unassuming and weak presence, lost in a sea of stronger personalities. This all works brilliantly to the film's advantage, and the slow build toward Freddy's eventual boiling point results in a truly memorable and emotionally potent climax. In addition to keeping the performances on track, Mangold also brings a fitting, gritty style to the proceedings. The aforementioned climax is a truly impressive display of image and sound coming together in perfect unison, and Mangold's use of isolated effects, frequencies, and slow motion, perfectly place us within Freddy's POV, making the scene much more dramatic and impactful. Unfortunately, despite the solid direction, Mangold's script does have a few weaknesses. An unnecessary voice over from De Niro bookends the film, adding nothing to the proceedings, and there is some clunky, expositional dialogue peppered throughout (the reveal of how Freddy lost his hearing is a good example). On top of that, the plot feels like it could have used an extra twist or turn near the end, and a lot of the story is pretty unrealistic and a bit clichéd. I get that the town of cops is really close knit and that Donlan's influence is iron clad, but it's a little hard to believe that certain flagrant choices wouldn't somehow expose the gang's illegal behavior. Still, when put into the context of Mangold's more mythic, western inspired intentions, these lapses in logic and unoriginal developments are mostly forgivable. 'Cop Land' is an interesting urban twist on the classic western formula. You can only push a good man down so far, before he finally fights back, and when Freddy eventually reaches his breaking point, his anger is palpable onscreen. Though some scripting choices are a little unrealistic and clumsy, the overall plot is tight, the performances are great, and the character work is surprisingly effective. 'Cop Land' might not be a true classic of the genre, but it has aged quite well, and for me, is actually one of those rare films that seems to improve with time. 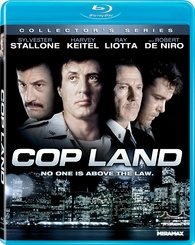 Lionsgate brings 'Cop Land' to Blu-ray on a BD-25 disc housed in a standard case. The version of the film presented is the director's cut, which runs about twelve minutes longer. After some skippable trailers, the disc transitions to a standard menu. The packaging indicates that the release is region A compatible. The movie is provided with a 1080p/AVC transfer in the 1.85:1 aspect ratio. With surprisingly robust colors and clarity, this is a strong transfer that features some nice pop while retaining a natural, filmic appearance. The print is in good shape but there are some specks visible throughout. A light layer of grain is present, giving the image some welcome texture. Detail is often great, showing off every tiny crevice and world weary wrinkle on the cast's hardened faces, though some shots are softer than others. Colors are quite rich while still retaining a slightly gritty quality. Shimmering waters, flashing cop cars, and the lit up New York skyline all provide some striking pop, and blacks remain nice and inky. Contrast is solid, with good intensity and little blooming. I was actually pleasantly surprised with the strength of the transfer here, and 'Cop Land' shines rather nicely on Blu-ray thanks to an authentic and detailed image. Fans of the film should be pleased. The audio is presented in an English DTS-HD MA 5.1 mix with optional English, English SDH, and Spanish subtitles. Though relatively quiet, the track comes alive when it needs to and features some very strong and artistic sound design choices. Dialogue is clean and full, but there are some minor crackles in the high frequencies. Though modest, separation across the soundstage is effective, with some decent ambiance hitting the rear speakers. Howard Shore's powerful score fills the entire soundscape and really bolsters the mood and tone of the film. When guns do start to blaze, surround use is solid and bass comes alive with some striking kick. The film's climax is a brilliant display of deliberate sound design, using dissonant frequencies to mirror Freddy's auditory POV while adding drama and tension to the scene, and it's all handled perfectly in the mix. Dynamic range is great and balance between all of the elements is fine. With great design work and strong technical proficiency, the mix does a great job of adding intermittent immersion in both broad and subtle ways. Lionsgate has put together a solid but slightly underwhelming assortment of special features, including a commentary and some deleted scenes. 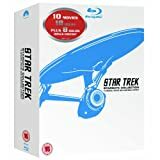 All of the extras are presented in standard definition with Dolby Digital 2.0 sound and no subtitles. Commentary with Writer/Director James Mangold, Producer Cathy Konrad, and actors Sylvester Stallone & Robert Patrick - With Mangold steering most of the conversation, all of the participants provide an informative and entertaining track. Lots of amusing stories are shared about what it was like working with such a legendary ensemble, including some candid anecdotes about a few polite disagreements that occurred on-set. 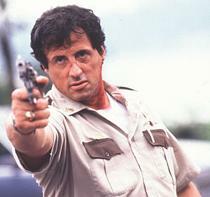 Stallone describes how he achieved his physical transformation and confesses to being a little intimidated by De Niro. Mangold also details the major differences between the theatrical edit and the director's cut by pointing out all the additional footage. Filled with interesting production trivia this is a very strong commentary that fans should definitely check out. Cop Land: The Making of an Urban Western (SD, 14 min) - This is a brief but insightful look at the film's production with cast and crew interviews. The participants explain how they got involved with the project and detail the series of events that got the script made. Mangold discusses the story's parallels to classic westerns and Stallone discusses what drew him to the role. Though the requisite mutual complimenting is present, there is definitely some worthwhile information here. Storyboard Comparison (SD, 2 min) - A splitscreen featurette is included for the film's violent climax that compares the original storyboard drawings with the finished scene. Deleted Scenes (SD, 5 min) - Two deleted scenes are viewable separately and with or without commentary (by the same participants as the feature commentary). The two scenes included both deal with the film's racial themes and were cut because they were a bit too overt and lacked subtlety. 'Cop Land' is an entertaining and suspenseful crime drama that puts a modern and gritty spin on tried-and-true western conventions. Led by an exceptional ensemble of heavy weight actors and solid direction from James Mangold, the film has actually improved with age. The video transfer is strong and the audio mix features some inventive design work. Supplements are a bit light, but the included commentary is entertaining and insightful. While this "Collector's Edition" isn't exactly stacked with extras, this disc is still recommended.